Can You Hard Boil a Broken Egg? Can You Eat a Broken Egg? How Long After I Cook Hard-Boiled Eggs Are They Still Good to Eat? 3 Can You Hard Boil a Broken Egg? Eggs can be baked, scrambled, poached, fried or hard-boiled, and given all these variations, the question of long they can be safely stored is a good one to consider. A bacteria called Salmonella enteritidis can be present inside the yolk, but hard-boiling eggs makes them safe to eat. How these eggs are handled, and the temperature and place where they are stored in the refrigerator, are all contributing factors that affect the storage life of a hard-cooked egg. Hard-boiled eggs are safe to eat for up to one week after cooking, as long as they're kept in the fridge. Even before the eggs are cooked, proper storage will help your eggs have a longer shelf life. According to the U.S. Department of Agriculture, eggs should be stored in the back of the refrigerator, where it is coldest, and not in the egg cups on the side of the refrigerator door. Hard-boiled eggs kept inside the egg carton or in a container at the back of the refrigerator will stay fresh for up to one week. There is a protective coat of mineral oil put on the outside shell of eggs. Washing eggs can remove this coating and increase the chances of bacteria entering the egg. When eggs are hard-boiled, this protective coating is completely removed, which is why hard-boiled eggs only last for one week, while raw eggs can be good for up to five weeks if kept unwashed in their shells and in a refrigerator at or slightly below 40 degrees Fahrenheit. You might wonder whether the hard-boiled eggs decorated and hidden for Easter egg hunts are good to eat after they have been found. The University of Arizona Cooperative Extension says Easter eggs are safe to eat as long as they are not kept out of the refrigerator for more than two hours. After two hours, the eggs start to dry out and become more likely to host bacteria or mold growth. Once present, bacteria inside the shell can multiply at a rapid rate. Throw out any hard-boiled eggs you find several hours or days after the egg hunt is over. Ironically, the older the egg is, the easier to peel once it has been hard-boiled. For easy peeling, plunge them in a cold water bath right after boiling. This also helps cool them down for peeling. 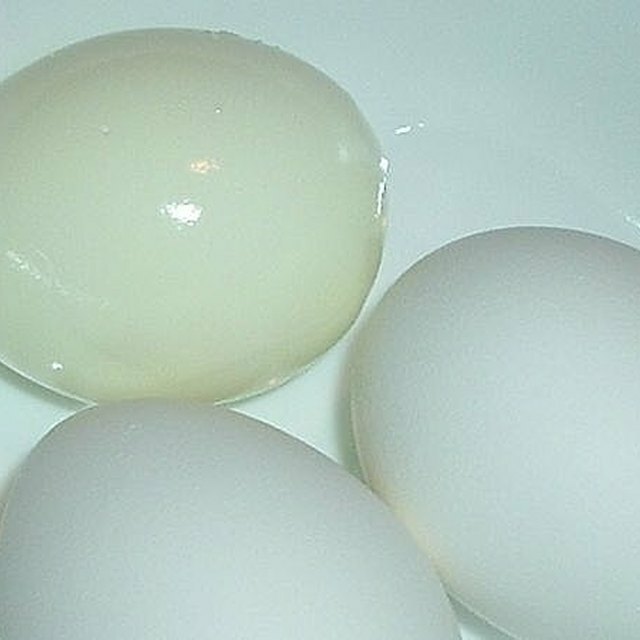 Hard-boiled eggs that have been cooled in a water bath are even easier to peel after they have been stored in refrigerator, because the inside of the egg starts to separate from the shell when cold. Eggs that have been cooked outside of the shell -- such as scrambled or fried -- don’t keep as long as hard-boiled eggs. To maximize their storage life, cool the cooked eggs quickly by placing in shallow containers, and refrigerate within two hours. They will keep for three to four days at most. When you separate egg yolks from whites to use in baking, you can safely keep the remaining and unused part of the egg in a sealed container for up to four days. Can You Eat Hard-Boiled Eggs Even Though the Shells Are Cracked? What Causes a Green Ring Around the Yolk in a Hard Boiled Egg? Are Boiled Eggs Healthy to Eat? How Long Will Eggs Last if Covered in Mineral Oil?